When it comes to knowing Nigerian Celebrity Illuminati Members, it is essential we keep in mind that Illuminati is a secret society that is an affiliate of the Church of Satan sect. 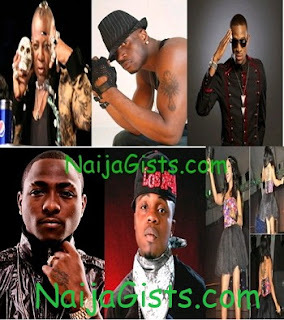 As we have earlier mentioned it is difficult to have the exact list of Nigerian Celebrities in Illuminati secret society however, the above people have been rumoured to have ties with Illuminati in Nigeria. To those who think Illuminati members are only present in developed countries like America, Canada and Britain, we can authoritatively confirm that you’re wrong. Illuminati exist in every country of the world. The side effect of joining any secret cult is that whoever joins will sacrifice their soul for fame which has eternal consequences. We should not speak what we don’t know! Who so ever that join this cult that is called illuminaty, shall seen itself in blame for i know one thing for sure, when the lord of lord the master of all master we come to judge this world they we stand in the front of God thrown and answer question and at the end they shall be put in the hail fire. Lie as end but any thing of thee jesus christ thee son of God is 4ever? hmm! O lord my God let thea mercy b fall upon my soul i am a sinner lord but do nt look upon our sins but look upon thea mercy nd grace.d end tym z nw but i first advice ma self repent wisdom 4 d kingdom of God z at hand nd i also advice u all out there 2 repent for d kingdom of God d most high z at hand.fada in thea hand i put my soul av mercy o lord do nt forsake thea pple lord nd do nt put us in shame.Amen. Hi people, all these things are just to distract people, just believe in Jesus christ as your personal Lord and saviour, work according to the righteousness you will see the Glory of God thank you. don’t judge anyone.I am who I am.6forit. judge no one.I’m who I’m . judge no one.I’m who im . DAT hw we roll.6for it. Only ALLAH can guid and protect us. His strength is sufficient for me. For what can it profit a man,to gain the whole world and lose his own soul? JESUS lead us rite. I cant imagine pple luv moni dan God. D actual time is near.